Thousands of Muslims have staged marches in London against ISIS, a march in London against terrorism and the rise of ISIS. While the majority of the mainstream media focus on the crimes committed by a very small percentage of Islamic fanatics, over 4,000 Muslims came together to say ‘not in my name’ during the the annual UK Arbaeen Procession. 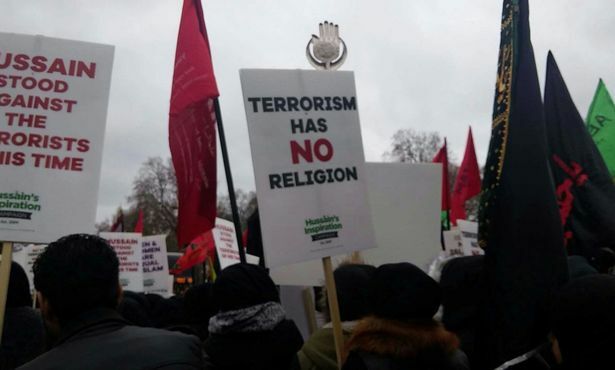 However, with the exception of the Mirror and Independent, this march was ignored by the media, who often call upon the entire Muslim community to “speak out against terrorism”. While the procession was based around the life of Imam Hussain, a grandson of the Prophet Mohammed who died after opposing a tyrant 1,400 years ago, the demonstrators said that his message of peace and human rights were just as pertinent now in the wake of terrorist incidents. Al-Sharifi, added: “The march is an annual event. But this year it was principally a stand against ISIS. It was full of banners condemning terror. Organiser Waqar Haider said: “This year we had hundreds of placards which were basically saying ‘no’ to terrorism and ‘no’ to Isis. A very direct message. It is good to know that there are some brave Muslims who are willing to step up and out to march against Isis. Think about how many people are afraid of Isis , all over the world. I can just imagine that Muslims would have that fear and even more due to the cruelty . . . beheadings and crucifixions. It is easy to imagine just hiding and not making waves. Bravo to these brave friends. Thank you for your courage! This entry was posted in Religions of the World, Travel, Uncategorized and tagged bravery, courage, Moderate Muslims opposing terrorism, Muslim marchers in London against Isis, protesting terrorism, Terrorism has no religion. Bookmark the permalink. I am glad to see this. Our Muslim community needs to come out against the evil doers terrorizing a world in the name of Islam. Hurrah for these fine folks. My feelings completely! Happy New Year! oh yes, I would like to hear an outcry, I think it would speak volumes to those who would destroy the world. Hopefully this example will now give courage to to other Muslims. Thanks for commenting. Absolutely bravo!!! they need to be louder though, I didn’t even know this had happened!